Looking for frictionless authentication across platforms and channels? Onegini Connect offers highly secure, integrated solutions for all your web and mobile authentication needs. Onegini Connect includes a strong authentication feature that offers multiple levels of security. You can customize the authentication process to your exact needs and provide the smoothest possible customer experience. For example, you can send users a push notification whenever you need a second factor of authentication. By adding layers of security as needed, you minimize disruption to the customer journey. The beauty of push authentication is that it uses your own mobile app as second factor authentication for the web environment. Users do not need to install any additional tools. This works with any login method used by the customer, from username / password to DigiD. And what’s more: you are not just offering a customer-friendly solution but also promoting the use of your app. Users without a smartphone can use one-time codes via SMS or text. Customers nowadays expect maximum ease of use, so they won’t be happy if they have to log in to each of your online portals separately. Onegini Connect allows you to provide secure access to multiple online portals with a single sign-on, offering your customers a frictionless experience across all of your sites. 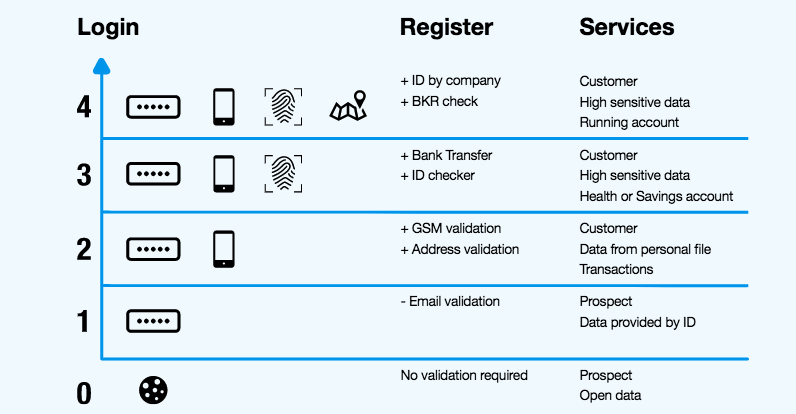 Want to implement multiple levels of authentication? Onegini Connect can help you meet all your authentication requirements while improving your customer experience. If you tell us about your situation, we’d be happy to show you our GDPR-ready solutions. Contact us today to get started or find out how it works in the technicals docs site yourself. Which processes will work best for you depends on your unique situation. Let's discuss and see what works for you.